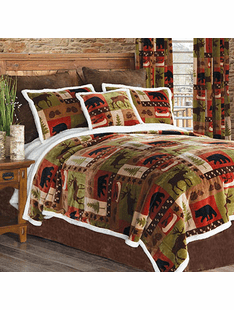 Rejuvenate your senses and enliven your soul with the majestic beauty of nature with our Patchwork Lodge collection of cabin bedding sets. 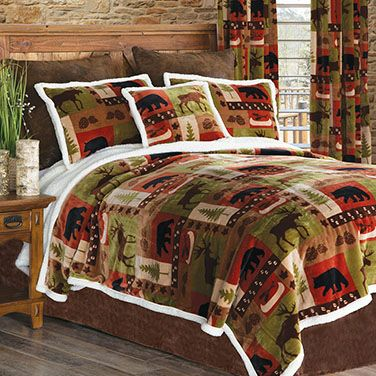 The bedspread is a super soft plush print featuring bear, moose, canoes, and pines that complement any black bear décor or furniture in your home or guest house. Matching shams and pillow incorporate the greens, rusts and browns found in a wooded glade. Lined in a cozy sherpa, our 4 piece comforter set transforms any bedroom into a cozy hibernation sanctuary for all guests! 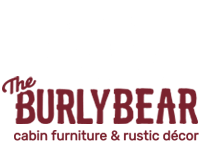 The Burly Bear is dedicated to curing your cabin fever at the best price. We will price match against competitors with the exact items. If you found our mountain cabin bedding sets at a lower price or have any questions, our Customer Service department is here to help! Call 1-855-277-2327 to reach one of The Burly Bear staff members or customer service representatives who will be more than happy to assist you.